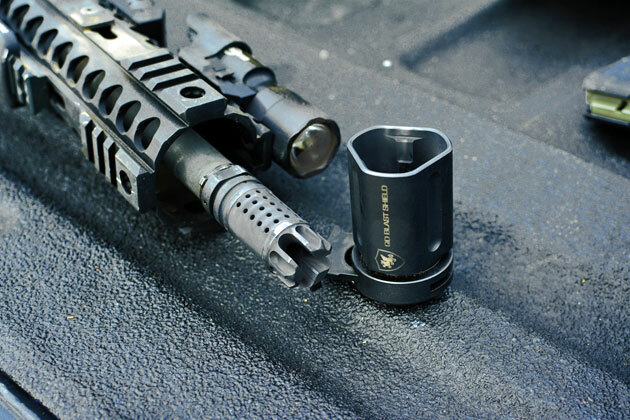 On the 16â€ barrel, pressure often exceeds 8000 PSI, jumping into the 11000 PSI range when you get down to a 10.5â€ barrel and the popular 7.5â€ barrels can see PSI exceeding 17000.Â Needless to say, your muzzle device must make the most of this pressure to aid in weapon control and they usually do this by directing the gas up and horizontally from the muzzle.Â Compensators such as the Battlecomp and brakes like the Lantac Dragon excel at maintaining the flattest possible recoil but there are some significant drawbacks if these devices are used in certain situations. I have been using Battlecomp for almost as long as they have existed; as far as compensators go itâ€™s one of the best out there and it lets me run the rifle just how I want.Â I know its limitations, however, and have experienced the dark side of compensators first hand in close-quarters where full-auto bursts in hallways can peel paint off of walls, punch holes in dry wall and generally upset your equilibrium.Â All of that concussive force also makes anyone to your left or right unhappy with your muzzle device choice and the closer they are to the muzzle due to chance or circumstance, the more likely it is for that force to affect their ability to function as you are firing.Â Comps and brakes both have a tendency to shatter side view mirrors in vehicles and break glass in general; itâ€™s also not uncommon for that pressure wave to run hell with your senses because your ears and peepers are quite pressure sensitive. 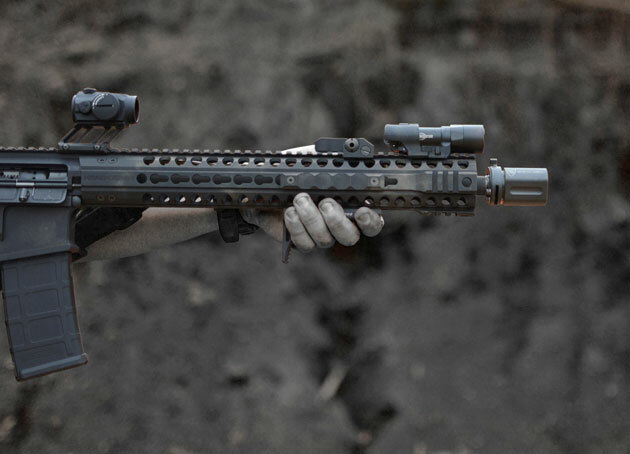 For the shorter barrel lengths the fix has been a flash suppressor such as the Noveske KX3 or its distant cousin the Levang Comp; these devices push all of that force out and away from the rifle but significantly change the recoil pulse of the rifle and not for the better.Â They leave you with a manageable weapon but it wonâ€™t have the same appeal as a flatter shooting compensator or brake.Â The other drawback is that once you put it on, you are married to it.Â A few companies have taken up the challenge of a detachable device to provide the advantages of a flash suppressor such as the Novkese KX3 when you want it and allow you to remove it when you donâ€™t. 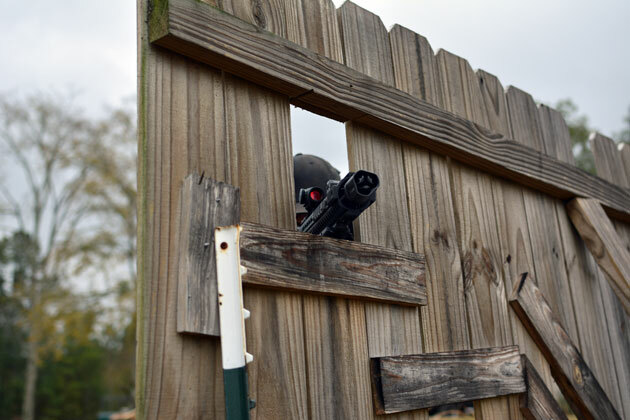 Â Griffin Armament recently launched one such device called the QD Blast Shield and I was fortunate enough to get one for testing. The Blast Shield is designed to work with Griffin’s QD muzzle devices such as the Flash Comp and Muzzle Brake and is designed to mount to A2 dimension muzzle devices as well.Â The QD means â€œQuick Detachâ€ and they arenâ€™t kidding.Â I received the Blast Shield with a Griffin M4SD Flash Comp, mounting of the device required me to install the M4SD on my rifle or use an A2 spec muzzle device (of which, I have none).Â The only difference in installing the M4SD is that the Blast Shield requires an indexing washer, which goes behind the muzzle device to keep the Blast Shield from rotating freely when installed.Â The Blast Shieldâ€™s travel screws are placed wide enough apart that there is a little play when installed, which is intentional and comes in handy when removing the device after a few hundred rounds of carbon buildup, something I discovered very quickly.Â Once the indexing washer and muzzle device are attached, the Blast Shield slides right on and locks in place in a few seconds. Since I was already doing an extensive review on the Head Down Products PV 15 rifle, I included the Blast Shield in my kit to run it during the testing.Â My first few rounds with the Blast Shield installed reminded me of the Noveske KX3; the rifle is pushed noticeably rearward and there is more muzzle climb during recoil; I expected this and thereâ€™s really no way around it.Â What I didnâ€™t expect is that the Blast Shield manages to negate the force in a much more manageable way when compared to comparable devices; my opinion is that this is because of the unique triangle shape design resulting in more surface area inside the device.Â It doesnâ€™t add noticeable weight to the rifle (5.4 ounces), nor does it have excessive forward/rearward movement when attached. I continued to punish the Blast Shield while testing the PV 15 rifle and after, all told it had around 700 rounds fired with it attached.Â It performs as advertised, directing the concussive force out and away from the rifle; in shooting positions from prone to barricade supported the Blast Shield did not cause secondary interference while shooting (such as excessive muzzle flash or kicking up debris). During the review it took a fair share of impacts against objects and the earth; the QD didnâ€™t fail or loosen and aside from the (designed) play in rotation, remained in place.Â Removal after heavy fire is advised with a glove and may require a few back and forth twists to break up carbon but doesnâ€™t make you break a sweat to remove it. 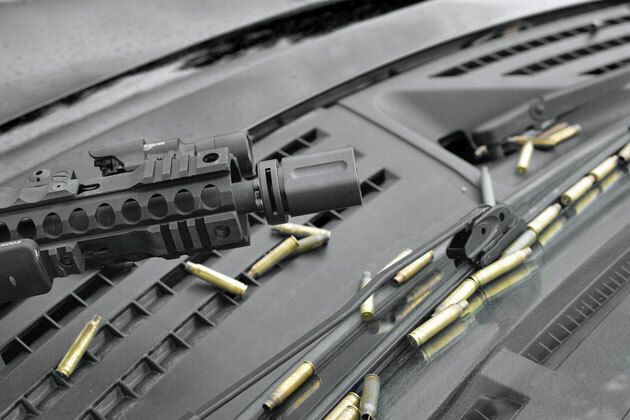 Giving me the best of both worlds makes the Blast Shield a quick favorite.Â For home defense applications, the Blast Shield would give you close quarters comfort when you needed it and allow you to pull the device when on the range or in a setting where redirecting muzzle gasses is not a concern.Â For the SBR/AR pistol market, the Blast Shield would be right at home to help manage the higher pressure gasses under fire while not forcing you to always use it if you donâ€™t want to. 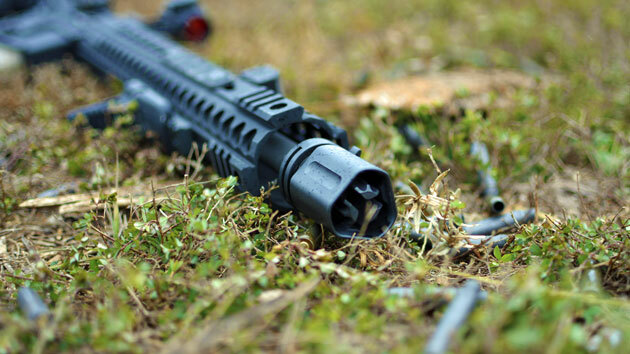 There are a few other manufacturers producing similar quick detach or screw off devices so there are other choices available, having used the Blast Shield for almost 1000 rounds when finishing this article I donâ€™t see any reason to pick up one of the other devices.Â If you want the superior recoil control of a compensator but the option to redirect pressure forward for close quarters applications, the Griffin Armament Blast Shield paired with their M4SD Flash Comp is a good combination.